You know that sound. Its fall and with its beautiful colors and cooler temperatures and also yet another allergy season. If you’re like me you will probably spend the better part of fall sneezing your head off, feeling stuffy and blah only to have it turn into a cold or worse the flu by the time winter rolls around. You may not be able to do much about the quality of air outside your home but inside is another story. Pet dander, mold, tobacco smoke and dust all play a role in your home’s comfort system. In fact, the EPA says that indoor air pollution can be much higher than the outdoor environment and has a tremendous impact on your health. But, you can improve the air your family breathes by following some simple steps. Reduce Pollution in Your Home. The simplest way to improve your indoor air quality is to rid yourself of the sources of the pollution. Some of these are easy to eliminate, for example your gas stove can be adjusted to decrease the amount of emissions or switching to cleaners that don’t contain ammonia or bleach that can inflame allergies. Some are not so easy, I don’t know about you but I wouldn’t give up my pet for anything but you can help there by bathing your pet regularly. Anything you can do to rid as much of the irritants will improve your IAQ that much more. Get a New Vaccum Cleaner. 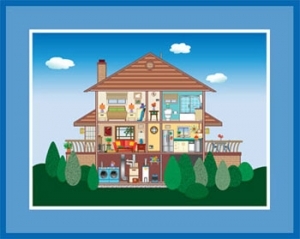 Update your vacuum cleaner to one fitted with a HEPA filter. Also, make sure to properly vacuum your carpet; it can take up to eight passes over the same are to remove all the dirt and dust trapped in the layers of your carpet. Like me, you may even consider making your home a “No Shoes Allowed Home” and leave shoes at the door to help control the amount of outside allergens coming into your home. Is your water hot enough? If you are not washing your bed linens in at least 140 degree water each week, it’s not. Washing laundry in hot water kills 100% of dust mites and their eggs; by only using warm water you are only killing 7%. Also, invest in a good mattress cover; it will help reduce the amount of mites living in your mattress helping you to sleep easier. Reduce Humidity in Your Home. You can also help fight dust mites and keep mold down by keeping the humidity in your home below 50%. Install & Maintenance CO2 and Smoke Detectors. Four hundred people die every year from carbon monoxide poisoning. Protect yourself and your family by installing a quality carbon monoxide detector in your home. It is recommended to test detectors every month and replace batteries twice per year. Air Cleaners like the IQ Air Perfect 16 whole-house air purifier can help by removing bacteria, pet allergens, mold spores, dust and pollen. The Perfect 16 is hospital grade and in fact is the choice of Ty Pennington and the Extreme Makeover: Home Edition crew when they need to create an ultra clean home for a family with health concerns. Reduce Bacteria, Mold, Fungi, and Other Pathogens with a UV Light. Maybe you can’t invest in something like the IQ Air cleaners right now but still want to help reduce the bacteria in your home. Something as simple as installing a UV light has proven effective against mold, mildew, fungi, viruses, bacteria and spores by breaking down their structure leaving your home feeling and smelling fresh! We believe an educated customer is the best kind of customer and that is our goal, to educate our customers so that they can get the best possible service and product. No one should ever feel like they are being taken advantage of and at AC Wizard we strive to make sure that every customer is an informed customer and has all the information needed to make an educated decision and never feel they are being taken advantage of. When Quality Matters, call AC Wizard at 214-342-2665, we are here to help.